The Women’s Leadership Fellows (WLF) program is a selective cohort of individuals who identify as female currently enrolled at the Trachtenberg School who meet monthly to build leadership and community through skills-based workshops, a mentoring program, and networking events. Monthly sessions are led by vetted trainers who volunteer their time and expertise to focus on negotiation, conflict resolution, verbal and nonverbal communication, and management skills. Trachtenberg School alumnae, including previous Women’s Leadership Fellows, serve as mentors to current WLF participants. Mentors are alumnae who provide fellows with coaching and professional development support. Women’s Leadership Fellows also have the opportunity to network with current and past fellows, George Washington University alumni, and other professionals. 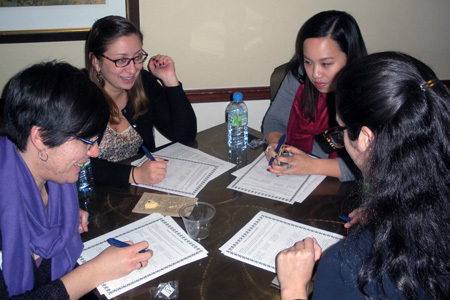 The participants are chosen by a panel after a competitive application process. Two student co-chairs coordinate the planning and logistics of the program in partnership with the Trachtenberg School Administration. The Trachtenberg School’s Women’s Leadership Fellows Program prepares high-potential individuals who identify as female to be successful public service leaders through professional development, mentorship, and networking. Samantha Sears is a second-year Master of Public Policy student at the George Washington University with a focus in social policy. She graduated from California State University, Fullerton in 2016 with a Bachelor of Arts degree in communications - public relations and a minor in pre-law. Transitioning from having her own event planning business, Samantha's goal is to apply the skills she learns in her studies toward evaluating and reforming the mental health system in the United States. Although her background is in public relations and event planning, her true passion was found when she worked with nonprofits such as Liberty in North Korea and Riverside Life Services. Samantha hopes that her life and work experiences are a solid foundation to the experiences yet to come. 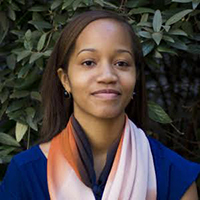 Shanise Williams is a second-year MPA student with an interest in housing and urban policy. After graduating from Saint Joseph’s University she served for two years as an AmeriCorps VISTA where she assisted with the launch of one of the first 5 Promise Zones. The West Philadelphia Promise Zone is a federal anti-poverty initiative based on a collective impact model, and Shanise worked in housing and resident engagement. Within this role she worked with federal, municipal, non-profit and community organizations to plan and implement a series of housing workshops to bring resources and services to community members. Afterwards, she worked at the Fair Housing Rights Center in southeastern Pennsylvania, where she completed intakes for victims of housing discrimination and led fair housing rights trainings for housing providers, nonprofit agencies and youth aging out of the foster care system. Her work in housing and community development grew her passion for public service and inspired her to attend the George Washington University, where she is excited for the plethora of learning and engagement opportunities. Please direct questions about the WLF program to Denise Riebman, Director of Career Development and Alumni Services at the Trachtenberg School, at [email protected] or [email protected]. Participants in the Trachtenberg School's Women's Leadership Fellows Program met at GW's Alumni House for an afternoon of networking and learning from each other and their alumni mentors. I was offered a promotion at work and I used newfound confidence from WLF and the negotiations training and asked for a better title than what they were offering (with the expectation that they would come to somewhere in between what I suggested and what they offered - that whole start high logic) - but they agreed to my suggestion!